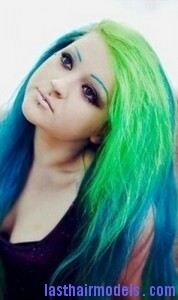 Having a green hair can give a very interning and unique look. The hair can be colored in this way for special events such as a Halloween. 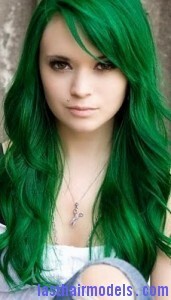 There are different types of hair color available in the market and green is one of the most unique versions when compared to other colors. If you are coloring your hair for the time, get help from a friend as hair coloring process can be a messy one that needs additional support to make it clean. 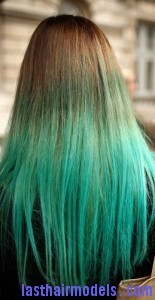 Here is a simple method that can be followed to achieve a green hair color temporarily. Before starting the hairstyling process, first wear hand gloves and put a cloth around your shoulders to protect your skin during the coloring process. Take a shampoo bottle with a quarter of the way and add one tbsp of water to shake it for about two minutes. Apply the mixture on your hair one at a time starting from the roots till all of your hair gets covered. 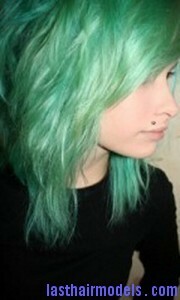 Leave the mixture on the hair for about half an hour to saturate your hair with green hair color. You can try to adjust the time based on the hair color and if you are going for a lighter hair color then it usually need less time when compared to a darker hair color. At last rinse your hair thoroughly with lukewarm water until the water comes out clean and use a towel to dry your hair.